The Gentlemen's Monthly: Tour de St. Edward. Today, starts our Tour de St. Edward- a weekly tour of resident rooms, study lounges and popular hangouts in Notre Dame’s favorite residence hall. 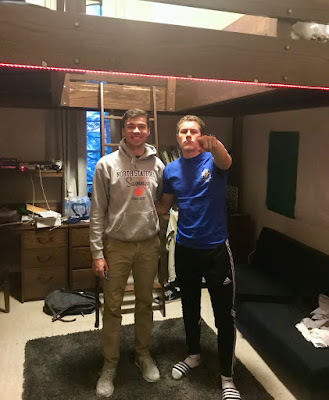 Our tour starts with room 323, a freshmen room for Joshua Chapple of Virginia and Conal Fagan of Derry, Northern Ireland. St. Ed: What did you think when you received your housing assignment placing you in St.Ed’s? Chapple: When I first learned I was living in Steds, I was very excited because I had shadowed a student living there and knew how nice the rooms were since they were lofted. But then to my horror, I realized that meant no A/C and as a Virginia boy that was a pretty scary proposition. But like any good gentlemen of Steds, I have adapted to the live without it. Fagan: First thought when getting assigned to Steds: I’m an Irish guy; how am I going to survive the heat without any A.C.? This was quickly followed by asking myself why I would want to live in a building that’s 135 years old? I would probably get stuck in the elevator on my first day because it hasn’t been renovated since the dark ages, while I wouldn’t be able to shower because there would only be one shower on every floor that had minimal water which would dribble down- not to mention the fact that it would probably be freezing. Not exactly what I would desire on December mornings. St. Ed: How’s “loft living”? Chapple: I love living in a loft. The first luxury is all of the space it creates in the room, but the true benefit is the thrill it provides when I almost fall down the ladder every single morning. The loft also allows a great bonding experience with my roommate, when we sleep we are in it together. If either of us tosses or turns the other one is going to feel it. This togetherness has really allowed me to better cope being alone and way from home. Fagan: It’s safe to say that it’s a lot better than my assumptions prior to moving in. Of course, I get the odd freight when the whole bed creaks whenever either myself or Josh wriggle about in our beds. Everyone gets pretty jealous of how nice our dorm is, or more accurately, how spacious the room is in comparison to their own. St. Ed: Aside from your loft, what makes your room unique among the other rooms of St.Ed’s? Chapple: Our room is unique in our Irish pride (and thats not just the Fighting Irish). Irish country music or McGregor fight songs can often be heard coming from our room and a beautiful Irish flag dominates the decor of the room. Fagan: It is the only room where the Irish flag is displayed legitimately, while having somebody in it that requires a translator every time they speak to someone else. St. Ed: What do you wish your room had? Chapple: I often find myself wishing that the room came with a maid that would make my bed and organize my desk. Fagan: If we had our own coffee machine, getting up at 6.30 wouldn’t be such a struggle. Also, having a balcony as well as a skylight would be pretty nice. St. Ed: Say, the word in the hallway is that you want to transfer to another hall. Is that true? Chapple: Under no circumstances would this be true. The traditions and gentlemen of Steds make it easily the best dorm on campus! Fagan: Becoming a member of the Men's ND Soccer Team, I can’t deny that I haven’t spoken to representatives of other dorms. However, after discussing personal terms with my agent and my family at Steds, it is simply unthinkable to leave this incredible place. No amount of money, not even the £200 million which was paid for Neymar, could pull me away. Loyalty is everything. I suppose I’m just too much of a gentleman! Wow. There you have it... thoughts and musings from Steds 323.